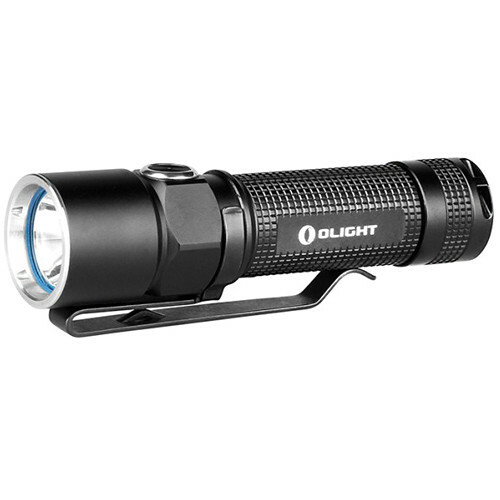 Designed as an everyday carry (EDC) light, Olight's S15R Baton Rechargeable LED Flashlight is a compact and durable 3.6" LED flashlight that runs on an included 14500 750mAh rechargeable battery which is charged by the included Micro-USB charging dock. The low-profile side activation switch provides four output levels and a strobe mode with a memory function to remember the last power setting used as well as quick-access to the brightest level and a lock-out mode to prevent accidental activation. The switch features a battery power indicator which glows red when the battery is running low. Reverse polarity protection prevent damage from improper battery installation and a thermal management safety function provides overheat protection by automatically dropping to medium output after 15 minutes of constant turbo output. Complementing the S15R's performance is a strong housing made of lightweight aluminum with anti-scratch type III hard anodizing and stainless steel head ring. A glow-in-the-dark o-ring in the bezel helps to locate the flashlight in the dark. It is IPX7-rated to be submersible to 3.3' and impact resistance to 5.0'. A flat tail cap with a strong magnet supports hands-free use and an aluminum pocket clip is provided. Tempered glass with two-sided anti-reflective coating provides a very high light transmittance rate. Thermal management safety program drops Turbo output to high output after 15 minutes of constant on. Box Dimensions (LxWxH) 7.3 x 7.1 x 3.2"